Greece closes banks, limits withdrawals ahead of bailout referendum. 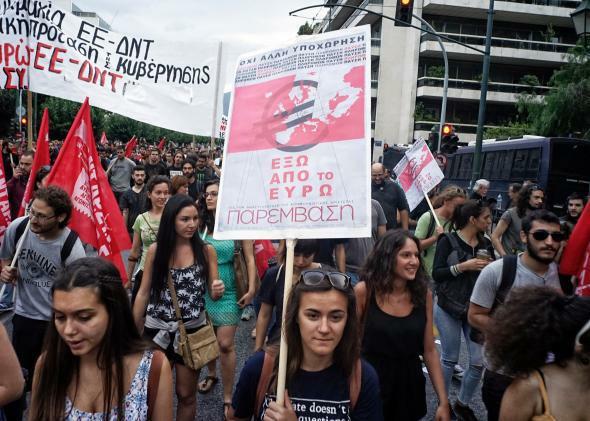 Anti-austerity protesters participate in a demonstration on June 28, 2015, in Athens, Greece. Update, June 29, 10:15 a.m. Stock markets across the globe responded to the latest Greek financial woes with sharp declines on Monday, the New York Times reports. The Euro Stoxx 50 index of blue-chip eurozone stocks, London’s FTSE 100 index, Hong Kong’s Hang Seng market, China’s Shanghai composite index, Australia’s S&P/ASX 200, and Tokyo’s benchmark Nikkei 225 stock average were all down sharply. Greek markets and banks are closed until July 6, the day after a scheduled referendum on how Greece would respond to European bailout conditions. Original post, June 28, 2015, 5:21 p.m. Greece continued down the road to financial collapse on Sunday, as Prime Minister Alexis Tsipras announced that banks across the country would remain closed Monday and that capital controls would be put in place, limiting the amount of money depositors can withdraw on a given day. The announcement followed a decision by the European Central Bank not to increase emergency funding to Greek banks, which Tsipras has denounced as “blackmail” and “an unprecedented act by European standards.” The prime minister added that deposits in Greek banks were safe, addressing fears of a total financial meltdown. Tsipras had called for a referendum to be held next Sunday on the conditions Greece’s creditors—the International Monetary Fund, the ECB, and other eurozone countries—were demanding for a further bailout, which included cuts to salaries and pensions as well as tax increases. Parliament approved the referendum last night, and Tsipras’s left-wing Syriza party is encouraging citizens to vote “no,” but there may be nothing to vote on anymore as the current bailout program expires Tuesday and the creditors have no intention of extending it. The European Commission took the unusual step of publishing the latest proposals for a bailout deal, but it’s not clear whether these proposals are still on the table. In the meantime, Greeks continued to line up at ATMs to get cash before it was too late, amid reports that withdrawals would be capped at 60 euros a day as of Tuesday to prevent bank runs. There are also reports that Greek banks will remain closed until July 7. Such measures will have a major impact on people’s everyday lives, and may dampen public support for Tsipras’ hard-line position. The Guardian is live-blogging the situation as it unfolds. The U.S., meanwhile, is pushing its European allies to reach some kind of compromise that will keep Greece in the eurozone—after all, the effects of a European financial crisis would likely be felt here as well. President Obama called German Chancellor Angela Merkel today to discuss the situation, and Treasury Secretary Jack Lew spoke with the IMF’s Christine Lagarde and the German and French finance ministers to encourage them to extend Athens some relief. But citizens of Europe’s economic center (particularly Germany) have grown weary of bailing out the periphery in recent years, so compromise will be a tough pitch for Merkel to make to her voters, even if she wants to. Europe wants Greece to cut its pensions more than it already has—which, in some cases, has been as much as 40 percent—but Greece only wants to cut them half as much and make up the rest with higher taxes on businesses. In other words, both sides agree how much austerity Athens should do, just not how it should do it. The problem, as it always has been, is the politics. Syriza insists that it has “red lines” over pension cuts it cannot cross, but Europe has quite literally drawn red lines through them and said, take it or leave it. This hardline stance is more about warning anti-austerity parties in Spain and Portugal that there’s nothing to be gained from challenging the continent’s budget-cutting status quo as it is about the €1.8 billion in pension cuts—not even a rounding error in the context of Europe’s economy—that it wants from Greece. Both sides feel like they can’t negotiate any more, so they’re not. Read more of Slate’s coverage of the Greek financial crisis.